Alternating rows of Tunisian knit stitch and regular Tunisian stitch create light, airy texture and fluid drape in this relaxed pullover. 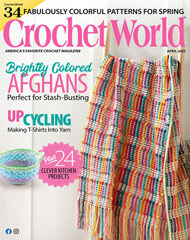 This e-pattern was originally published in the August 2013 issue of Crochet World magazine. Size: Includes Woman's S through 3XL. Made with super fine (sock) weight yarn and size H/8/5mm afghan hook.